How an unprecedented disaster led to an unprecedented coordinated action to keep toxic ash out of the Russian River watershed. Everything changed on October 9 when Cadden’s residence burned to the ground, his belongings reduced to a pile of potentially toxic ash and heavy metals. Once the initial shock passed, he turned his attention to protecting the waterway below. The forecast called for rain, and the threat to the creek was real. With thousands of burn sites to clean-up, contractors for the Federal Emergency Management Agency (FEMA) wouldn’t be out to remove debris until it was too late. 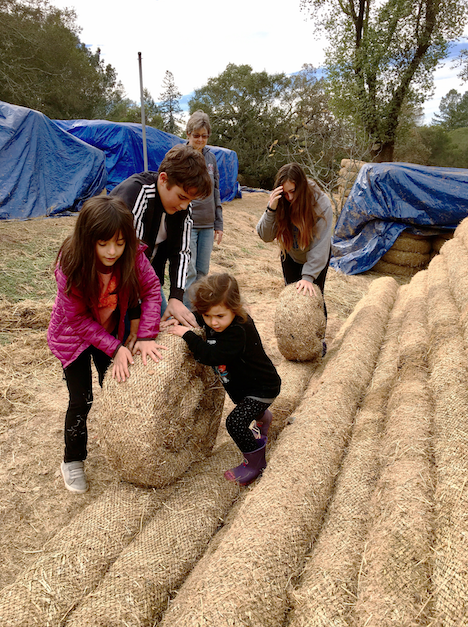 That same week, Cadden was forwarded an email from the Sonoma Ecology Center with information about a coordinated emergency effort to provided free rice straw wattles for watershed protection. Used to create a perimeter around debris fields, the wattles contain the ash before it can enter waterways. Cadden contacted Chris Grabill, a local contractor and member of the hastily convened Watershed Task Force. Soon, a truck arrived with eight heavy, snake-like wattles. The lightning-fast delivery of the wattles—followed by a massive volunteer mobilization to get them installed around thousands of burned structures—was made possible by an unprecedented coordinated effort by the County of Sonoma, the City of Santa Rosa, the North Coast Regional Water Quality Control Board; local businesses like Sonoma Clean Power, Jackson Family Wines, and The Wattle Guys; and nonprofits like the Sonoma Ecology Center, Russian Riverkeeper, Community Soil Foundation, Clean Water Alliance, and Sonoma Conservation Action. It was all driven by an urgent imperative: to protect the Russian River and Laguna de Santa Rosa watersheds from environmental devastation. 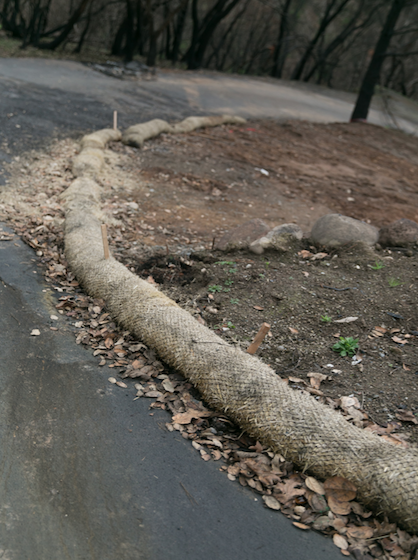 As Cadden, like thousands of homeowners and renters, dealt with the shock of losing his home, the Regional Water Board jumped into action, strategizing how best to keep ash and debris from ﬂowing into storm drains. It was an extraordinary challenge and one with dire consequences: Once toxins and sediments get into waterways, it’s nearly impossible to get them out, threatening harm to wildlife and the environment. The clean-up effort can also be expensive: A large wildfire in Colorado led to millions of dollars in clean-up costs at the reservoir where Denver residents get their drinking water. A Watershed Task Force also formed right after the catastrophe, which included Dougherty, county officials, city representatives, and NGOs. They had no choice but to hit the ground running, says Chris Grabill, program director for the Watershed Task Force through Sonoma County Conservation Action. According to Grabill, ash in waterways poses a threat not only to fish, wildlife, and public health, but it could negatively impact the viability of organic agriculture and grapes in the long term. “This is a big deal in a county so invested in organic agriculture,” says Grabill. He recalls those early meetings in October, the debriefings held in army tents furnished with “ratty tables and hanging lightbulbs” outside the county buildings. The task force poured over data, performing something called “geo-spatial triage” by using U.S. Geological Survey maps to deduce exactly which burn sites posed the highest risk for waterway pollution and mudslides. FEMA, Cal Fire, and the Governor’s Office of Emergency Services buzzed around them. “It was all let’s go, let’s go . . . very wartime,” Grabill recalls. The geo-spatial triage pointed out an immediate need for perimeter controls in Coffey Park. The closely spaced homes on urban hardscape had turned to ash piles that would run-off directly into storm drains. Dwellings near creeks were also pushed to the front of the line. “What’s the most effective and quickest thing you can do with the resources you have to get ahead of these things?” says Grabill. In other words, what was the best management practice in this case? The team quickly settled on correctly and strategically placed wattles. The Regional Water Board reached out to The Wattle Guys, a local company with established expertise in storm water technology. One of company’s owners, Doug Allard, had lost his home in the wildfire but that didn’t stop him from joining the effort. After receiving the water board’s order for a large number of wattles, which are made from rice straw sourced from the Sacramento Valley, he turned the former site of his home into a mobile wattle production facility without knowing whether his company would be reimbursed for the materials. Producing the wattles in the middle of the fire-decimated neighborhoods of Fountaingrove and Hidden Hills allowed for easy delivery and simplified logistics in the face of unfathomable destruction. Allard estimates The Wattle Guys have distributed at least 40 miles of wattles, some donated and some sold at cost to the City of Santa Rosa, the county of Sonoma, and Cal Fire. Stretched end-to-end, they’d span the distance from Rohnert Park to Cloverdale. Another three truckloads were donated to Friedman’s Home Improvement, which has been giving out free wattles to fire-impacted homeowners. At the same time, Sonoma County Recovery—a website established specifically to facilitate fire recovery efforts—took on the task of coordinating the hundreds of volunteers needed to install miles of wattle on an urgent timeline. An outpouring of volunteers came out to unload wattle, lay them in trenches, and nail them down to stay put through the rainy season. So far, the widespread effort to protect the watershed seems to be working, says Mona Dougherty. In coordination with the Sonoma County Water Agency, the water board has done in-stream monitoring for pollutants in creeks near burned areas. Pockets of Fountaingrove continue to struggle with water contamination from benzene, a volatile hydrocarbon commonly found in plastics, but this appears to be an isolated incident. Still, time will tell how severely the watershed has been impacted. Ongoing monitoring and continued deployment of erosion controls will be key going forward. In December 2017, Sonoma Clean Power donated a combined total of $150,000 (specifically earmarked to continue watershed protection efforts) to Russian Riverkeeper, Clean River Alliance, Sonoma County Conservation Action, and Community Soil Foundation. The funding allowed for Grabill to be hired on full-time as a coordinator of this many-limbed movement. “This immediate investment in our watersheds will reduce the risk of erosion and landslides—protecting life, property, and water quality—while making us more resilient going forward,” said James Gore, county supervisor and chair of Sonoma Clean Power’s ad hoc committee on fire relief donations. So far, so good. And yet, years of work, water quality testing, and diligence lie ahead to ensure a clean water supply for fish, animals, and people of the Russian River watershed. For Jim Cadden, the water protection work provided some control in the face of overwhelming loss.